History Road at RAM… A big hit with car buffs. 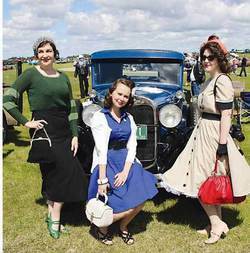 The weekend of June 8th and 9th was like turning back the clock in Wetaskiwin as more than 500 antique and classic cars made their way through the City to Reynolds Alberta Museum to participate in the annual History Road: the Ultimate Car Show weekend. Approximately 2000 people attended the event on Saturday, and another 1700 on Sunday to rekindle fond memories of their interest in automobiles. History Road is hosted by Reynolds Alberta Museum to instill interest and knowledge of historic, antique and classic vehicles but more importantly to provide a medium where car enthusiasts can share information and friendships surrounding the ownership, restoration and preservation of vehicles. The grounds at Reynolds Alberta Museum were jam-packed with a spectacular display of more than 500 cars, trucks and motorcycles spanning more than a century of automotive history. Regardless of what type of vehicle you may have owned, or the type of vehicle you wished you had owned at some stage of your life, you were likely to find it at History Road. The lineup featured a display of rare vehicles from Reynolds-Alberta Museum’s collection plus those of enthusiasts from across Alberta and western Canada. There was everything from open-bodied roadsters to 1960’s muscle cars; from tiller handle steering to electronic fuel injection. Over the past 15 years, this car show has become a festival-of-sorts, where the vehicles are displayed and paraded, participants connect with old friends and meet new ones and all the onlookers praise the cars and envy their owners. At the end of each day, show participants got into the action and "cruised" in a parade through the City of Wetaskiwin. Spectators came to RAM on June 8th and 9th to see vehicles that have been restored to their pristine glory. This was made possible by the generous sponsorship of the City of Wetaskiwin and the Alberta Motor Association.